A ... transient moment of climactic action, perception, and feeling is represented by a ... work for Cardinal Borghese, the Apollo and Daphne.... Bernini has seized on the second in which the panting god, in hot pursuit of the chaste Daphne (Ovid, Metamorphoses I: 450-567), is foiled when she calls on her father, the river-god Peneus, for rescue and is transformed into a laurel tree. 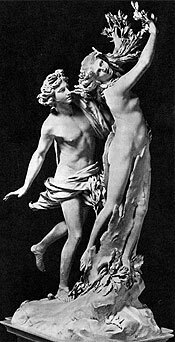 The toes of her left foot have already taken root, bark has shot up around her left leg and started to enclose her waist, her fingers and her hair are already turning into leaves and twigs, but the change is so sudden that the expression of terror has not yet left her face nor that of desire the Classical features of Apollo. The fidelity with which the softness of female flesh; the lithe body of Apollo; the textures of hair, bark, and leaves are rendered is no more dazzling than Bernini's craftsmanship in carving the scores of minute and slender projections from fragile marble. He has reached in his mid-twenties the height of his ability at pictorial sculpture -- the negation of everything Michelangelo stood for, but the fulfillment of promises made by the daring Ghiberti in the Gates of Paradise [1425-50] ... and by Desiderio da Settignano in his marble reliefs .... Evanescent effects of melting texture, translucency, and sparkle so dissolve the group into the surrounding space that it is as if Bernini had been able to carve light and air as well as marble.